We’ve said it before, and we’ll keep saying it as long as there are people who need the benefit of gold in their savings portfolios and retirement accounts: Gold is historically one of the best hedges against inflation and currency mishaps. Gold serves as an insurance policy against the crashes and collapses that the world is seeing more and more of as fiat monetary policy becomes universally more irresponsible. Should the currency shocks keep spreading, paper assets are no safe haven. 5. Gold always wins the currency wars. Neil Mellor, a foreign exchange strategist at Bank of New York Mellon in London, recently told Bloomberg, “We’re seeing a new era of currency wars.” Central banks will continue to devalue their currencies against each other in 2014 to gain perceived advantages. As global currencies continue to be watered down, they all lose purchasing power, so measuring one currency against another is more and more meaningless. None of them are strong in absolute terms; those that are considered “strong” are simply faring not quite as poorly as the rest. That’s why gold’s steady purchasing power in the long term blows them all out of the water. In the race to the bottom, gold wins merely by not entering the self-defeating competition. Like the movie War Games taught us, the only way to win is not to play. All major currencies are playing. 4. Quantitative Easing is not done. Not by a long shot. Janet Yellen as the next Federal Reserve Chair is troubling to anyone who understands the damage being done by the policies already enacted by the central bank. She competes with “Helicopter Ben” Bernanke in dovishness, and was behind the creation of Quantitative Easing (QE), so it is hard to imagine QE winding down to zero this year, as some expect. And only a $10 billion reduction, from $85 billion to $75 billion a month, has been announced so far. Jim Rogers suggested to Birch Gold Group that if the economy takes a marked turn for the worse next year, the taper will be scrapped altogether. 3. The Fed is forever blowing bubbles, and the entire stock market is the biggest one yet. This is a logical result when you pump $1 trillion into the economic system each year. The liquidity must go somewhere, and it has gone largely into equities, which has caused prices to completely disengage from fundamentals. You get into dangerous territory when the price of a stock has more to do with monetary policy than the ability of a company to make a profit… yet that is where we are. Beware. 2. The “recovery” is on paper only. Beyond the headlines and the attention grabbing numbers, it is all BLS BS – trickery and “statistical illusion”. It is cover for an interventionist Federal Reserve and government to hide their abject failures in interfering with the market. Mistakes of the past have been compounded by more of the same as our bureaucrats refuse to admit the obvious: Laissez-faire capitalism, divorced from political favors and crony giveaways, is the best way to provide the most prosperity to the most people in the fairest way possible. It is by no means perfect, but it is the height of arrogance for a handful of bureaucrats in ivory towers and cement cubicles to think that they can do better by forcefully enacting their own policies. They can’t do better… but they can control the numbers and the methodology to make it look like they have. In the end, it will all come crashing down (as it always does) with much pain to be had by all. Gold can serve to dull that pain. The powers that be may rarely learn any lessons, but you can. History shows that gold can be a safe haven when the markets get rough. Despite some of the flowery numbers currently being peddled by Washington, we are still in rough waters, with more ahead. 1. In the end, he who holds the gold wins. China knows this. India knows this. Those nations have been stockpiling for decades, with most reports suggesting that China has been importing even more gold in recent years. The same is true on a micro level for you. For short-term currency shocks or collapses, gold will almost assuredly convert into whatever alternate medium of exchange emerges when dollars buy nothing. Even if the dollar averts collapse, he who holds the gold still wins. Imagine if your parents had stashed away money in a savings account for you to buy a house one day. Fifty years ago, the median cost of a new home was about $18,000. Needless to say, if your parents turned those $18,000 over to you today, you would not be buying a house. Even if that account had earned 2% interest, thus netting nearly $50,000 today, that still wouldn’t buy you a house. But imagine if instead of putting those $18,000 into a savings account 50 years ago, your parents had converted the money into gold. Today your parents would be handing you over 500 ounces of gold – worth in excess of $600,000. No wonder Jim Rogers looks forward to one day giving the tremendous gift of gold to his daughters. This is how gold wins for you and how you can make it win for your future. 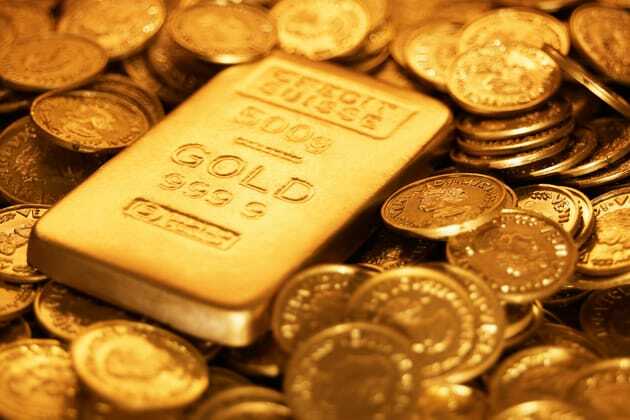 Those are some of the best reasons to own gold right now – in 2014. But remember: Even if there is no catastrophic collapse in the coming years, it still benefits you greatly in the long term. Thousands of years of history prove it. Make gold your New Year’s Resolution. Call us to get started.